From downtown Peninsula, Ohio, head east on West Streetsboro Rd. Happy Days Lodge is located at 500 W. Streetsboro Rd. 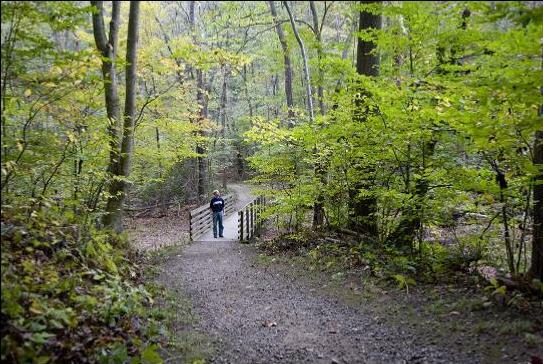 Entrance to official CVNP park assets is free; fees for special programs and additional accesses may be required. Tickets are required for all CVNP special events and concerts. Haskell Run offers a quick 30-40-minute creek valley hike with a pair of cool wooden bridges; Boston Run offers a 3-plus mile hike of moderate skill, layered with beech, dogwood, low-lying meadows and creekbeds. There is plenty of wildlife to take in here on both trails, including smaller woodland creatures like squirrels, chipmunks, and all varieties of birds including woodpeckers. They’re all a big reason why these trails tend to get busy. To that end, nothing is better than tackling these trails on a fair-weathered, early-weekend morning. There’s broad appeal to all levels of hikers here, between both trails. Most of the trail is sure-footed; if you have good boots and good weather, you’re likely to linger on the trails to take in all the sights. Having Happy Days Lodge nearby means that trails and special events of all variety can be linked together. Sightseers will love it, too; though some portions of Boston Run might not be for folks with knee/hip or mobility issues. It’s worth some reconnaissance before you bring non-hiker seniors along with you on that trail, just as a heads-up.